Take turns playing blasting Kaos of his throne in his rapid-fire showroom. While the Skylander player aims and launches his disks, the Kaos player manoeuvres his minions to block shots and protect Kaos. Can your Skylander blast away all the minionsand get a direct hit to send Kaos flying? Contains game board, Skylanders blast turret, 10 discs, 5 minion targets, Kaos figure and cardboard Skylanders figures. For 2-4 players. For ages 5 years up…. This toy costs approximately £24.99 (for the latest and best prices make sure you check our retailer list for the Skylanders Block n Blast Board Game above). 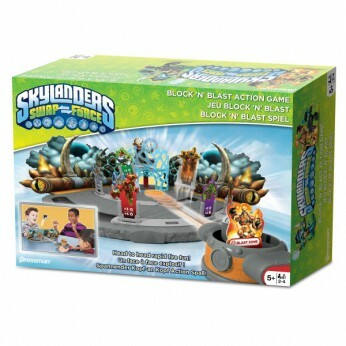 In our review of Skylanders Block n Blast Board Game we classed it as being suitable for ages 5 years, 6 years, 7 years, 8 years but recommend you check the manufacturer specific advice before purchasing.